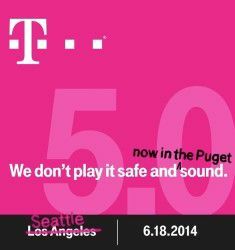 Uncarrier 5.0 is upon us. On June 18th, T-Mobile’s set to use an event in its home city of Seattle to announce the next phase of its industry-changing plans. And a rumor published by PhoneArena purports that T-Mo is set to – yet again – remove a customer pain point by drastically changing the way it works out your monthly bill. Currently, in the market – as all of you are aware – your $70 postpaid plan doesn’t total out at $70. There are other taxes and fees involved, which vary in cost depending on State. Something you will be completely used to by now. Just like you were used to subsidized handsets, 24-month contracts and international roaming costs. If the speculation is right, T-Mobile could start including all fees and taxes within the stated monthly rate. If you’re on a $70 per month plan, that’s all it will cost. This rumor certainly goes along the same lines as previous changes: Being an accepted, but frustrating part of the mobile industry in the U.S. But it is worth taking the usual pinch of salt. We haven’t heard anything to deny or confirm any of this so far. But I have to say, I would not be surprised. It’s typical Uncarrier in style. Also, when you consider the $10 price bump of the Simple Choice unlimited plan, although other perks are now included in the deal like international calling and a higher tethering allowance, $80 per month over $70 would certainly give T-Mo some leeway in soaking up taxes and fees. Would you be up for this? Can T-Mobile easily tackle the logistics? Also, if you have any further information to share on Uncarrier 5.0, email cam@tmonews.com. ← T-Mobile brand to remain if Sprint merger’s approved, $2B compensation if blocked? I’m hoping that they will also make it so that people that have to pay deposits will get $0 down as well, because that’s the biggest frustration I get when trying to sell T-mobile plans that deposit customers also have to pay a huge chunk of change out of pocket for a new phone. wrong, you get charged all the same prepaid or postpaid. the reason prepaid seems cheaper is you are not being extended a line of credit for the carrier, you pay in advance for your service, device, taxes, ect. International calling will be great moving. From the rumor mills I have read, your $70 plan may not be $70 after all, and it may just be inclusive, but at a higher cost. For my lines of service I pay $140 per month SET, but after taxes its $175 – I have multiple lines, and live in California, and in San Francisco, one of the highest taxed municipalities (as in, we pay $3.50 per line just to have 911 access, even on tablets without voice access, not including $2 per line city utility fees) So I would assume from that statement, my bill in SF would be “$175” and anyone else with these lines would be $175 as well, told upfront, surcharges and all. Rather than cutting the bill, it would just be upfront pricing, more clarified. That route would create huge issues including differing pricing between prepaid and post paid. The biggest reason for post paid now is the equipment installment plan and I doubt they want to look like they are charging a premium for you to take an equipment installment plan. In my opinion if taxes getting included resulted in post paid plans only going up then they are better off the way things are now. I’m guessing the end of corporate discounts was supposed to pay for this uncarrier move? Im wondering if this is the case then why not just announce the end of no corporate discounts and the included taxes at the same time? It would have been received a lot smoother because most people receiving 15% off and getting taxed usually break even. People losing the discount but having taxes paid for or ‘included’ won’t see a material increase on their bills. That’s what I think would happen as well. That would be a catastrophically bad PR move. Not worth having an event for at least. This explains why they wanted to eliminate corporate discounts. Typically a corporate discount and taxes was mostly a wash. This essentially is corporate discounts for everyone. Honestly, I have always seen taxes as part of a necessary evil. I would rather see handset or service discounts for loyal customers. I would love this. I honestly have left T-Mobile for a while due to cost on my end. Taxes were always annoying (to be not included in the actual plan cost). If this is true, I may just come back. Nobody said there wasn’t? I simply said that I left due to cost, I didn’t say any carrier has lessor taxes. And actually I’m using Cricker (formely Aio) which the taxes are included, that was the only point I was making with taxes (that they are included in the actual plan). I was hoping Uncarrier 5 was going to be unlocked sim phones out of the box. It would reduce hesitation of people switching to T-Mobile and if it didn’t work out for them those devices would work on other carriers. It also wouldn’t cost T-Mobile much money AND they could block devices with owed installment plans and failure to pay to protect themselves. This wont stop people getting unlocked phones and shipping them overseas. iiirc, some new samsung phones that are sold as unlocked in North America, need to be “activated” with a NA sim with like 5 minutes of usage before it can be used else where. I read something along those lines last year when I was looking into getting an imported 32gb S4. Samsung locks the phones to the region they’re intended to be sold/used in but can be unlocked with an appropriate sim by making a call or two. I would save ~$34 per month? I find that highly doubtful to be true, there may be some savings but not a removal of all fees and taxes. Doubt it seriously T-Mobile would pay your taxes for you considering in states like California, New York, Washington, Florida taxes are 25-30% of the bill. no way that taxes take up 25-30% of your bill. I live in California and I have 4 lines. My taxes and surcharges are just under 9% of my total bill. You pay $49.98 for two lines ($24.99 each)? Which plan are you in? I’m not pp, but I’m on a 50/mo 2 line family plan. 1000 min. How is this going to affect the grandfathered plan like value plan? I’m basically paying 73.57 a month including tax? Going by all the other uncarrier events I would think it only applies to Simple Choice plans. thats kool i guess. lol some times i do wish i would jump to the simple choice plan when the unlimited everything was 70 dollars and unlimited roaming in 120+ countries but i cant complain the fact im only paying 73.57 for unlimited everything including taxes. The only tax in prepaid plans, including the Simple Choice ones, is sales tax. This would be cool, but it would only align the postpaid plans with the prepaid ones. I live in and stay around Los Angeles, which is well covered. Speed is typically greater than 20Mbps/10Mbps and have peaked to greater than 30Mbps/20Mbps. Cell-fi! Hope you can work out a deal to get one for free! Just be nice and act like you are pained by not being able to call people even when important! I’ve been in the local store before to ask and they were almost at that point to freely give, but I wasn’t willing to go postpaid because of the taxes. Still must consider because I can still get the refill cards as a sort of reward from another program in a round about way, soooo… options. Hope this happens. Waiting for Wednesday. Their bloatware isn’t too bad comparatively, and WiFi calling is an especially useful thing to have. I’m getting a bit burned out on Android personally though so now that iOS 8 is going to support WiFi calling I’ll probably get an iPhone 6 and give it a whirl. The 5S is nice, but with my pretty big hands I’m hoping the rumors of a larger phone will come true. I’ve messed around with a 5S in stores and while I like the experience, my fingers take up the entire display lol. MetroPCS has done this for years and was profitable. They did not just include the taxes into the price, the taxes were paid by the company. If you had a $50 unlimited plan, you paid $56 and change with taxes…when Unlimited For All hit, your bill went to $50, period. It can, and has been done. As a customer, it is awesome to see a company make moves to keep customers interested. Doesn’t make sense to do this (not because it’s not a great move) because most consumers don’t take taxes/fees into consideration (they are the same across all tier 1 carriers). TMO doesn’t compete in the prepaid market, they compete again contract carriers. This kind of change would lend credence to the rumors that Sprint would keep the T-Mobile brand around (likely making them the new MetroPCS) if they merged. The only feasible way this would make sense (legally speaking) would be for TMO to reclassify all their plans as “prepaid” which do not carry the same fees/taxes in all 50 states as contract service. The most current rumor is that the sprint brand is being folded into Tmobile leaving Tmobile in charge. Don’t know where you got that theory from. You do know what the word “rumor” means right? There is no such thing as the most “current” rumor. T-Mobile brand will not go away in any merger deal (you can bank on that). The name stands for something in the industry and has far too much momentum to toss in the trash. This would explain why DT would keep a 20% stake (despite claims they want out of the US market). DT is a global brand and they want to keep it that way. Sure there is, as time goes on rumors evolve and if you accept the possibility that rumors can get more accurate closer to “launch” then saying “most current” is valid. It also works if speculating on a possible outcome based on a series of previous rumors for other aspects. It doesn’t change that they’re still just rumors until an official statement is made. Not disclosing that you are referring to a rumor would be the bigger problem than saying “most current”. Not sure if the government and cities would take the loss of 50 million odd taxable accounts without a fight. For most Simple Choice plans it would be cheaper for T-Mobile to pay taxes and fees rather than a 10-15% corporate/association discount. They recently did away with most association discounts so they have room to pay taxes and fees. It is different with cheaper grandfathered plans but this Uncarrier might be only for Simple Choice customers. i work at tmo, rumors about a merger sprint are greatly unfounded. if soft bank gets to buy tmo, then tmo would take over sprint, and sprint would be no more. Shoot jump me to $80.00 plan if it’s true! That’s cheap as it is, Go US T-Mobile! I am proud to be a returning loyal customer! My cousin’s wife’s family are all switching from Verizon & AT&T to T-Mobile US they love T-Mobile US! I am paying $130.00 w/ 2 lines that would save me about $20.00 a mouth! This is great! If it happens I’ll be even more happy with these guys! Side note: T-Mobile’s “home city” is Bellevue, WA, a suburb sitting east of Seattle. The event itself may be, but probably isn’t, held in Seattle. I suspect they used that city’s name because it is more recognizable. It probably is in Seattle itself. They moved the event there from LA because Amazon has a launch event in Seattle the same day and they need to make it convenient for the media who have an interest in both events. Given Amazon probably announcing a smartphone, which is gonna be huge news, I wonder why they didn’t just change the date. Maybe they figure they can gain some leverage by being the first carrier to announce network support for the Amazon device? Maybe the $1.61 regulatory recovery fee could go away. That thing is annoying. Although the amount is trivial, I would have to agree. Especially when trying tho interpret what th he heck the fee description even means! Why don’t I pay any of that with Straight Talk? Its also no contract. I only have 1.62 added to my 45$ plan. It was a lot more when I had T-mobile, even after I had switched to their prepaid at one point (before Uncarrier).. Don’t quite understand the laws…Taxes are what they are but it seems carriers decide to add certain fees to recoup their costs. They’re fees they dont have to include and sometimes make up creative names for. Well, quite a few of the government required fees have to paid no matter what, but prepaid carriers generally include them in the total cost. Postpaid adds them to the bill. However, all the postpaid carriers (and landline carriers, cable companies, etc), to my knowledge, add a regulatory recovery fee. This is a carrier charged fee to recoup other “costs”. It isn’t government required, just a revenue generator. Isn’t the big announcement the extremely affordable ALCATEL ONETOUCH Pop7 tablet?? What T-Mobile uncarrier 5.0 should do is have phone with no bloatware or minimal bloatware. That would be amazing because them wet would get faster software updates. Still waiting for 4.4.3 on my LTE nexus 7 on T-Mobile… Blame Verizon? Or the rumored Android Silver program amirite? Why would I downgrade to the iPhone over that small hassle? Removing bloat isn’t that hard. Haha, you can delete any and all bloatware from a Windows Phone. One of the nicest perks about using that OS. My only T-Mobile related app is the MyAccount one, which I do use. Question: Long tenure customers with say 15 year with the carrier, will we be getting any sort of Loyalty discounts? Or are those days over once our contracts end and we become “regular” like everyone else who is not under contract anymore? Just wondering since I will be loosing my employer discount soon and I haven’t called the Customer Loyalty department in a very long time. I wonder if that team even exists anymore. The Customer Loyalty/Retention Department is still there. The main function of Customer Loyalty was to retain customers who pulled the “Gimme a deal or I’m gonna walk” card. The Customer would commonly be offered a free device (when they didn’t retail for 700 dollars), a 10 dollar bill credit for 24 months, or a one-time lump sum credit for 200 or so dollars. With that came a contract renewal (which made sense because if you are a business owner you certainly don’t want to give any of that stuff away only to have your customer walk anyway). Now T-Mobile doesn’t extend contracts, therefore it doesn’t make sense to do these free phones and buckets of free money to someone with no contact. So they will usually do a one time discount on a bill,a percentage discount on a device, or a 10 dollar discount for 6 months. None of which are a small thing. Thank You for the info. It makes sense. It would seem that when contracts end people would flock to metro since they are cheaper, on the same network, and most people don’t roam internationally. T-Mobile will loose $. I wonder if T-Mobile will just match metro pricing and kill one of the brand names. Let’s hope they finally completely do away with connection and upgrade fees. Or have they? I haven’t been paying attention (or paying those fees). They really made it obvious how stupid the average consumer is by charging a Connection Fee, seeing as they need you to connect for them to make any profit off of you…and most people just blindly went ahead and paid it. Then they pushed a little further with the “Upgrade Fee”, and more stupid people stupidly paid it…maybe Uncarrier 5.0 will be “We’re “not being stupid for you” by not charging you fees you shouldn’t pay in the first place”. There are no activation or upgrade fees anymore for anyone on the new plans. T-Mobile already includes taxes and fees in the price of its $30 “Walmart” plan. Further, instead of renewing directly with T-Mobile through the web site or My Account app, I buy the $30 renewal card from Target (a T-Mo partner for Brightspot) through the app with my Target loyalty debit card for a 5% discount, no sales tax *and* free shipping. if the simplified pricing goes thru tomorrow my bill for 4 iPhones is gonna be $102 w/ corp discount……NICE!! No more taxes? Wow, that would be nice! For the three lines on my account, the bill typically comes to just over $100 with a 15 percent discount. If they do away with the taxes and still keep the discount, that would bring it down to around $76.50 per month at $25.50 per line. That would be sweet, especially for me since I’ve been not only paying for my line but one of the others the past couple of months.